1. Place all the ingredients in a double boiler or in a large heatproof bowl over a pan of simmering water. Sir until the sugar has dissolved and continue to heat gently, stirring, for about 20 minutes until thick enough to coat the back of the spoon; do not allow to boil or it will curdle. 2. Strain the lemon curd through a fine sieve. Pot and cover in the usual way. Store in the refrigerator and use within 2-3 weeks. It nearly went disastrously wrong as I had it in my head that you only used the egg yolks and couldn't quite work out why it wasn't thickening. Eventually I looked again at the recipe and realised that I should have used the whole eggs! I still had the egg whites in a bowl, so whisked them up a little, then added the warm lemon mixture one spoonful at a time, with lots of whisking. Fortunately, it didn't curdle and only took another five minutes to thicken. and it looks lush, I'm going to savour every mouthful of my pot - thank you! This jar looks so pretty! 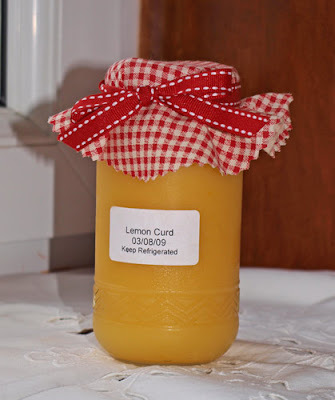 I just love lemon curd! Your lemon curd looks so tasty: divine even! What the Cook is that?